Cruise the Thames with London’s Oyster Card | Oh, the Places We See . 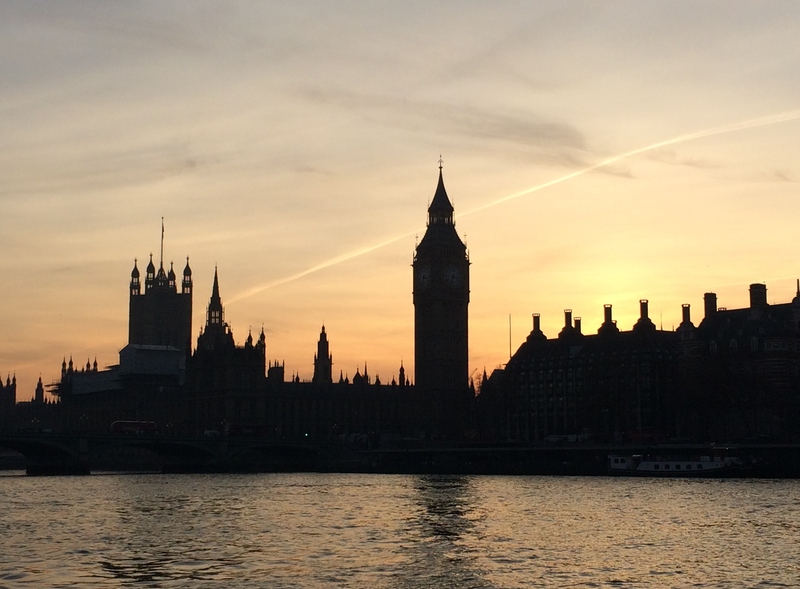 . .
Parliament forms the background for a memorable sunset cruise on the Thames. You never know just how valuable a concierge can be ’til he gives you information that 1) saves you money and 2) gets you where you want to be! Thanks to Grosvenor House: JW Marriott for hiring a man who understands Southern tourists (We have a drawl, ya’ll) and knows how to make their day. When we approached the desk and asked the best way to get to The Globe from the Mayfair section where Grosvenor House is located, the concierge immediately said, “Have you heard of London’s Oyster Card“? Good on most any London transport — the Oyster Card! And that’s how we discovered this little gem. With an Oyster Card, you can tool around London on just about any form of transportation: public buses, London Underground (the Tube), Docklands Light Railway (DLR), and trains. River boat fares are discounted with an Oyster Card, the little blue smartcard you pre-load with money at any tube station. When you want to ride, hop on and touch your Oyster Card to an electronic reader which deducts the price of your trip and shows you how much you have remaining. No cash involved. Don’t use it all in one trip? You can get a refund both for your deposit and what you didn’t spend. Check it out at participating tube stations. Is it only crazy, old Americans who take Thames Clipper selfies? Surely not. Purchasing an Oyster Card in London is pretty convenient, but you can order a Visitor Oyster Card before you leave home and have it mailed to you. It wasn’t, however, much more expensive to purchase one onsite. Boarding a ThamesClipper for the route to The Globe is easy. Just walk down behind Parliament where ships dock. Follow the covered walkways to the waiting areas where you wait — but not long. Many boats ensure short wait times. Covered walkways leading to the docks. Scan your Oyster Card. Board. And off you go. If you want clear shots of the skyline, head to the back of the boat, stand up facing the back, and brace yourself. 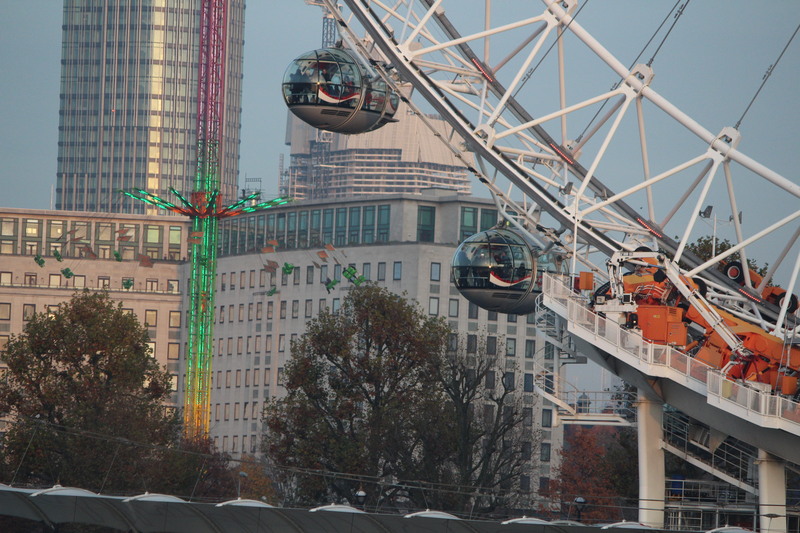 It’s worth it to get shots like this one of the London Eye . 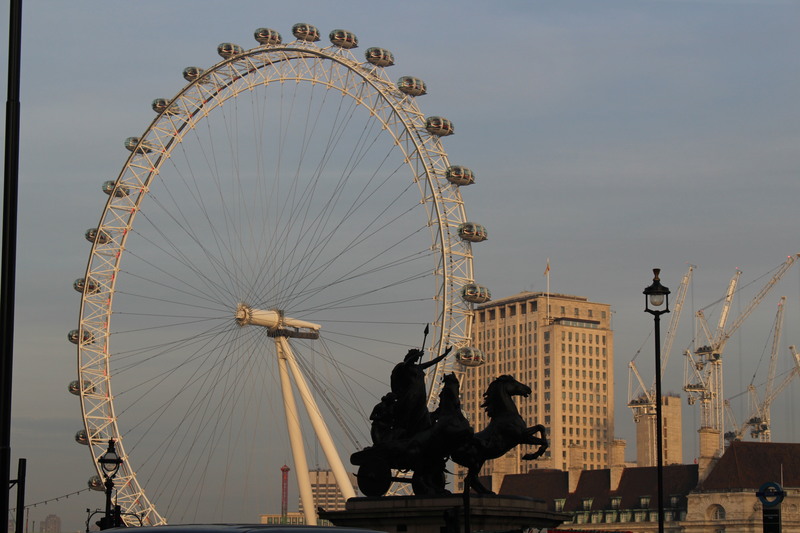 . .
London Eye at sunset — great time of day to catch this shot! or boats wrapping up their business for the day. A scene on the Thames. Of course, not all is lovely on the river. But beauty is in the eye of the beholder. This seagull must like what he sees! Traveling on the river takes you close to architecture you can’t see from a bus, like these ornate details on one of the bridges . . . 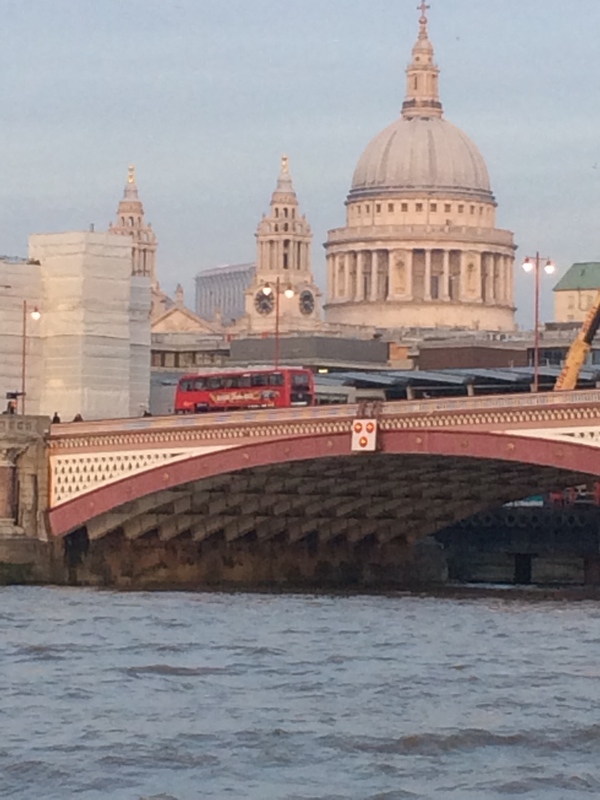 Spectacular details on this bridge on the Thames. or passengers crossing Millennium Bridge to St. Paul’s Cathedral. London Millennium Bridge was once called Wobbly Bridge when crossers felt a sway. But it was revamped and reopened, better than ever, in 2002. It’s just another day on the Thames for those making a living on the water. Birds know the right boats. But for us, it was a sight to remember. Backdrops like this become star attractions for tourists soaking up local color! Seeing London from the Thames. 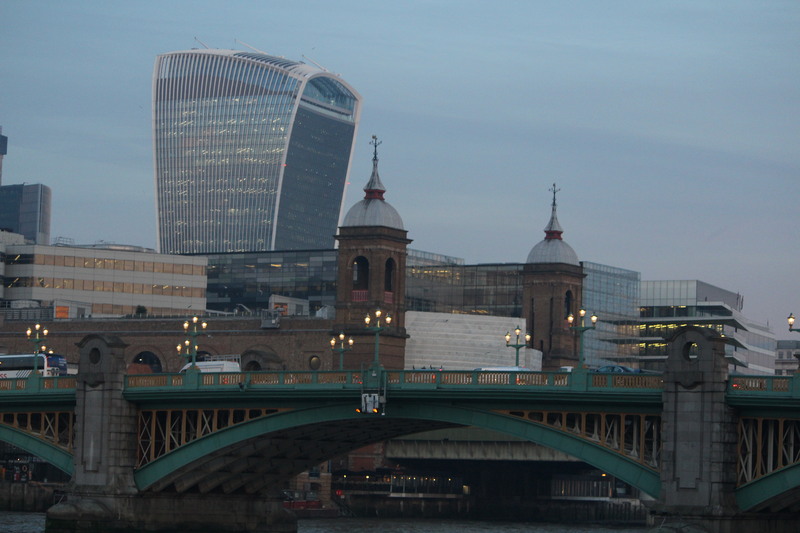 For pennies on the pound, a Thames River cruise may be one of your best memories of London. For more scenes of London, check out our series Postcards from England. This entry was posted in England, Travel and tagged boats, London, London Eye, Oyster Card, St. Paul's Cathedral, Thames Clipper, Thames River. Bookmark the permalink. Lovely photos! London is one of my favorite cities! Thanks so much. It’s true what they say about the two times per day to take photos: morning and sundown. I love the lighting! We thought the Oyster Card was a terrific invention — so easy to swipe and get around. Kudos to whoever created this system. And for a city this big, it works surprisingly well! We were surprised that a city would include river transportation in a city card, but London is right on top of things. Have fun on your trip! Public transportation in Europe is so much better and functional than here in the US. Beautiful photos. The public transportation was so responsive, frequent, and easy to use. I don’t know if it’s all better than U. S. transportation, but for such a large city, they really do have it down pat! Thanks for commenting. Thanks for the compliment and your preference. We were so fortunate to take the river boat at sundown. Fun to see how setting sun casts golden light on the iconic skyline. Would go back again anytime! Great blog, glad you enjoying your stay. I don’t live in London but I have an Oyster card! Those cards really are fantastic and make travelling around in London so much easier! I was amazed. Especially on the buses where you just have to click and then sit down. Great invention! Great shots of a wonderful city! It really is a great city. We had been before, but it was 42 years ago!!! Wish we had had more time on this trip. Now, I’ll HAVE to go back! We like using public transportation because it saves so much money. But I would also like riding in one of those black taxis!!!! It’s so fun to come upon something we can do for so little money that brings great pleasure! And this was it. Walking was another option, but cruising gave us a chance to feel the breeze and enjoy the sunset. Thanks for taking a look! Wish to visit London one day! Cruise looks beautiful.